Why is a go to market strategy important? Venture capitalists look for companies that can grow to be worth $100+ million. Such companies will have a good product that people want to buy and a good idea of how to get them to buy it—a go to market strategy. A go to market strategy starts with a strong value proposition. What is a value proposition and why is it important? If companies are making a product that customers want to buy, they have reached product-market fit and can focus on growing. Even once companies have a clear value proposition, they need to remain flexible and test it iteratively. 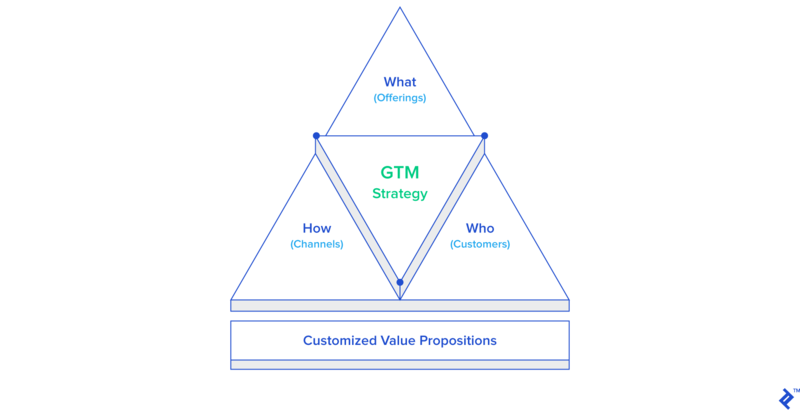 What factors should you consider when creating your GTM strategy? Products need to solve a problem for customers, who need to be clearly identified and targeted. However, if the target market is small and not growing, the company potential is limited. Sales and marketing efforts are inversely proportional and need to be right for the type of clients being targeted. As a venture investor, I spend most of my day evaluating tech startups as potential investments. This is a lot less glamorous than it looks on TV: We meet many companies, get to know great people, and learn about their ideas, but unfortunately only select a few to work with and build a long-term partnership with. Many people ask me what investors are looking for, which is simple to describe, hard to find, and harder still to create: a $100+ million business. A great read on this topic is by Christoph Janz, the SaaS guru. 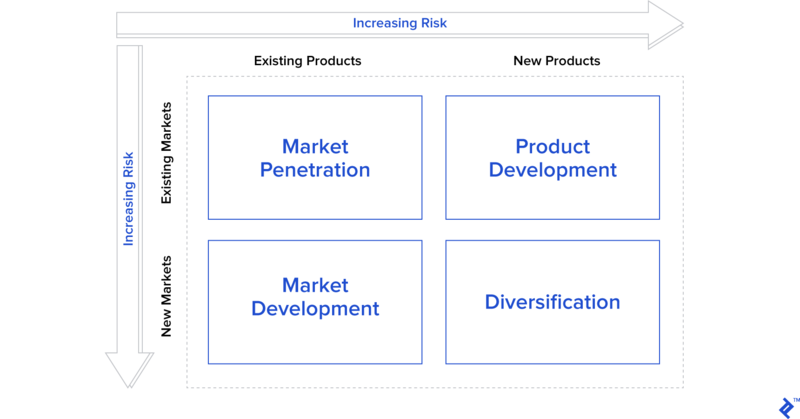 We do early-stage investments and find that the three things that matter most are team, product, and sales and marketing approach—including their go to market (GTM) strategy. I shall focus on the latter in this piece. When speaking with entrepreneurs, we ask them many questions about their go to market plan. Observing what makes a company successful in its growth efforts has taught me that this should be a key concern, but it is often an underestimated area that can be a bit chaotic and hinder growth. Balancing the right mix of marketing and sales is critical to the speed of growth that can then be achieved by a company. What we generally look for is whether the pricing structure, the customer base, and the sales strategy are consistent with the product and whether they are conducive to building a company a VC would consider investing in. Again, here Christoph Janz is correct: Every Startup’s Go to Market Strategy Has to Answer the $100 Million Question. A GTM strategy covers how to bring a product (or a service) to the designated customer. It is closely linked to the business plan and marketing strategies. It should cover every team of an organization but, unlike a business plan, it is product specific. In its most simple meaning, it is the plan you make to ensure that your product reaches the right customers and that you create a market presence. Once you are clear on what your value proposition is, what needs to be defined then is: what the offering is, who the customers are, and how the customers can be reached. All of these aspects need to be consistent with each other. When a company has a crisp and well thought out go to market strategy framework, they have already made good progress in actually executing on it. This is particularly important for companies that have found product-market fit and are facing a period of strong growth. All your client-facing staff need to be familiar with the details of the plan and be committed to executing it. This will determine the ability of the company to capture the market and maintain its position in it. A strong value proposition requires an iterative process: Customer feedback loops need to be built in at every step. This is important both in the product design step as well as later: Engage with your customers, build something they want and appreciate, and they will not only come back but also act as your marketing force (and your net promoter score will go up!). How do you do this? You can start with insiders and your early clients, who will be willing to give you feedback and will be honest, and use them for analysis and investigation, and then, based on what you have learned, build a proposition to be tested. As an example, we could look at the launch of the UberPool competitor, ViaVan, which happened this spring in London. ViaVan is a joint venture of Via and Mercedes Benz. In the case of ViaVan, the value proposition is affordable, ecological shared rides in central London. They are now very heavily promoting them through leaflets in strategic points in London and through referral codes. We are now going to break down the process and look at the individual steps. What Factors Should We Consider When Creating a Go to Market Strategy? This is a crucial phase: The objective is to identify what the minimum specifications of a product are. What is the problem we are addressing? How does our product solve this problem? Is this a new solution? If yes, why has no one done this before? Do we have a new technology? Otherwise, why is our solution superior to that of our competitors? What value does our customer receive from our product? What is our product roadmap? Entrepreneurs should have answers to all these questions before embarking on the rest of their journey. Where Do We Sell It? This may seem trivial, but it is extremely important—what if you have created something amazing that only a few people are interested in? Who wants to buy what we are making? How large is this market now? Will it grow? Can I prove this? An example that comes to mind are companies that target venture capital funds in Europe with due diligence products and services: This may seem like an interesting market at first glance, but it actually is not. There are not very many venture funds, and they tend to be smaller and have smaller budgets than private equity funds, for instance, so they offer limited income opportunities. Another important consideration to be made is on how the market will change and evolve. A handy visualization of this question is the Ansoff Matrix, pictured below. Who Do We Sell It To? Once we have determined which market we will target and have validated our assumptions about size and needs, we need to go one level further in our analysis and segment our customers. This analysis is based on two main variables: needs and behavior. Obviously, the techniques and layers of data taken into account will change depending on whether we are looking at individuals or businesses, but the principles don’t change. It is important that the segmentation is precise and relevant to your product. For example, if you are selling a new and improved umbrella, it is irrelevant to you to know the occupation of your customers: Where they live and what the weather is like there is more important than whether they work in healthcare. For ViaVan, the relevant customers are those that are price-sensitive, open to sharing a car with others, and that live and work in the areas they can efficiently cover. The final step is to create personas with a specific set of assumptions that need to be validated. At this point, we have a product that answers a specific need, we have decided which market to target, and we have segmented our customer base and created personas. It is now time to select our channel and decide how to reach our target customers. The first question is whether you need a high or low touch sales approach: This will depend on the LTV of the customer. Then we will have to decide whether to sell directly or indirectly. Will we have a physical store? Will we sell through our website? Through channel partners? Through affiliates? This is why it is so important to understand our customers’ buying behavior: A successful company, especially at first, will need to go to the customers and not try to change their behavior, which would be too complex and costly to do and you would most likely go out of business before effecting any change. Now it is time to build your sales team and define your marketing budget and strategy. This needs to be consistent with your customers: For example, if you are targeting large enterprise clients with a complex SaaS product, you will need to build a sales team of technical and competent people that will also be able to supply some consultancy and implementation services, and you will not really need to rely on social media marketing. On the other hand, if you are building a consumer internet product, you will need extensive marketing resources but a different sales approach. 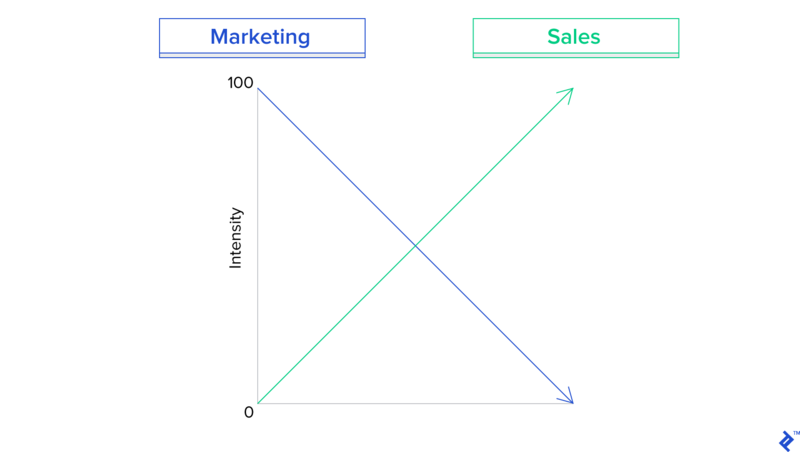 The absolute best framework to think about the interaction between sales and marketing is the one developed by Mark Leslie of the Stanford Business School. I highly recommend reading his piece on this topic. He states that the first question to be asked when defining a go-to-market framework is whether the product is sales or marketing intensive and use that as a starting point. The example he makes is jet engines—infrequently bought (for large sums) by approximately 100 system manufacturers—versus toothpaste, used daily by billions and a frequent purchase. How much value do our customers put on our product and how much are they willing to pay? How much do our competitors charge? How much does it cost us to make and distribute our product? Based on these variables, we can set a price, either adding a margin to our product or basing it on what we think the value of our product is in the market. Pricing strategies should be revisited often, particularly keeping a watchful eye on the competition. As you gather data on your product and experience from interacting with customers, the pricing strategy can be enriched with the learnings from the data. What's in a go to market plan? The go to market plan covers what we will sell (product), to whom (target clients), where (in what market) and how (through what channels). It is closely linked to the business and marketing plans, but it is product specific. It can be for new products or new markets. A value proposition is the reason why we think our customers should want to use our product. To create one, a firm should define their assumptions about what their clients' pains are and test them to see if their product solves them. If the value proposition is true, the firm has found product market fit. The segmentation of customers is an analysis of the client base that helps in refining our understanding of their needs and behaviors. It should be based on characteristics that are relevant to our product, such as geography, demographics, and buying habits. It will then help in creating customer personas. Natasha transitioned to venture capital after a career in banking, built in prestigious firms such as JPMorgan and A&M. She is now a part of the investment team at a venture capital fund, where she evaluates over 1,000 startups a month. She also has hands-on experience with startups, helping CyNation and EstateGuru raise funding and expand to the UK. She joined Toptal to keep her skills up to date and help entrepreneurs access funding.